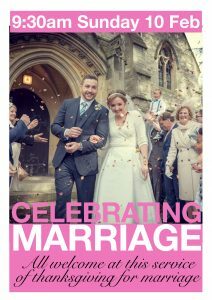 As part of National Marriage Week, we will be giving thanks for the part our church plays in celebrating marriage. At the 9:30am service on Sunday 10 February, we are inviting all those who have been married at St Mary’s (and anyone else who would like to come) to join us a for a special Sung Eucharist celebrating marriage. All are welcome, and special refreshments follow the service.